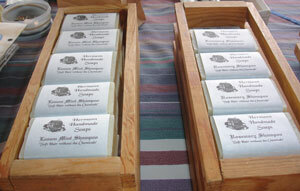 “The Best Soap in the World,” said one of our well-travelled customers. Why? What you put on your skin makes a huge difference in the way you feel, look, and function. 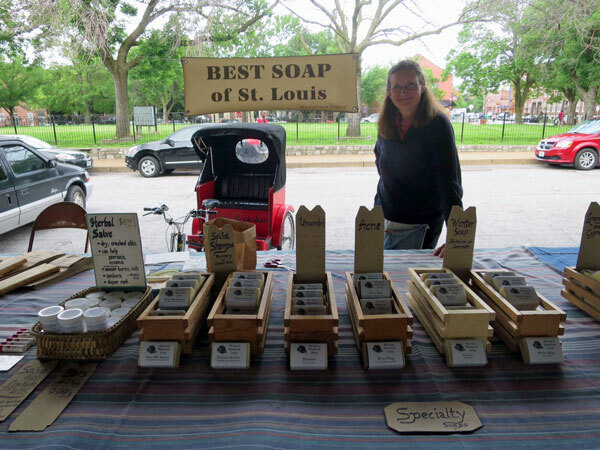 Our soaps have the best features of fancy boutique soaps, with olive and essential oils, yet at a cost that makes them practical for every day. Almond Wheat Germ – wheat germ gives gentle roughness and has vitamins that are good for your skin. Calypso Spice- excellent gritty shower soap with a potent blend of Eucalyptus, Cinnamon and other essential herbal oils. Cinnamon and Spice – zesty soap for hands or shower. Lemongrass and Cypress – citrusy, cooling, anti-toxic. Other uses: insect repellent, balanced cooling for menopausal symptoms. Sandalwood – A perennial favorite from India. Shampoo Bars – soft hair without the chemicals. A vegan soap and traveling aid. Can be used as soap or shampoo. Rosemary or Lemon Mint. Unscented – plain soap. Good for highly sensitive skin. 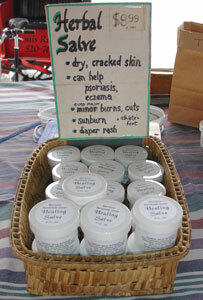 Healing Salve – a wonder-working, multipurpose salve with olive oil, lavender and healing oils. Lip Balm – herbal lip moisturizer. It comes in Peppermint, Cinnamon, Double-mint, and Chamomile.